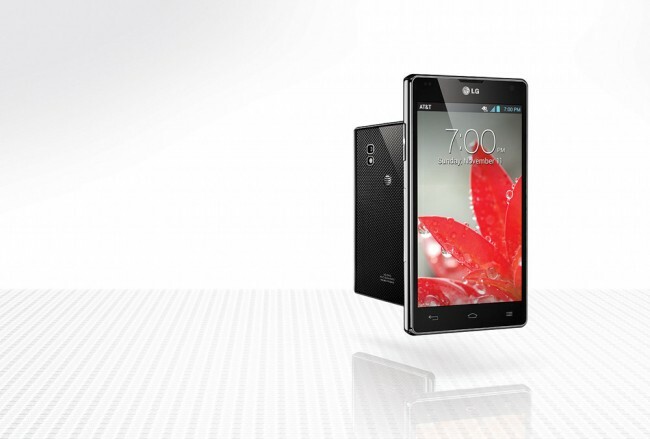 The LG Optimus G will arrive on AT&T and Sprint…at some point. According to LG, these two carriers will be among the first to offer it, we just don’t know when that will be. We aren’t even being told “coming weeks” or “soon” or “November” – it’s basically a mystery. I would assume it will arrive before the holidays or this is the most pre-mature press release in history. Either way, Verizon customers should be saddened, as this phone is a true beast. With its Snapdragon S4 Pro quad-core processor, 2GB RAM, LTE, 4.7″ True HD IPS+ display, 32GB of internal storage, 2100 mAh battery, NFC, and improved suite of software features, there are few phones that can match up to it on paper. The actual user experience will be something we will focus on the minute we get one in our hands, but so far, I’m looking forward to this phone. Once we have pricing info and a release date, we’ll be sure to pass it on. Sad that this won’t be coming to Verizon or are you not interested in LG products? ENGLEWOOD CLIFFS, N.J., Oct. 3, 2012 /PRNewswire/ — LG Electronics today announced that the high-powered LG Optimus G superphone will be available in the United States on the AT&T and Sprint networks. As the world’s first quad-core LTE (Long-Term Evolution) smartphone with the Qualcomm SnapdragonTM S4 Pro processor, LG Optimus G is not only one of the fastest phones on the market, but also one of the most powerful. Designed to set a new standard in the industry, LG Optimus G combines LG’s leading LTE, display and energy technologies with Qualcomm’s Snapdragon S4 Pro processor to create an extremely fast and incredible mobile experience. Equipped with a high-density 2,100mAh battery and impressive 4.7-inch True HD IPS Plus display, Optimus G users can seamlessly multitask between personal, business and entertainment needs and go beyond the boundaries of traditional on-the-go smartphone capabilities. LG Electronics USA, Inc., based in Englewood Cliffs, N.J., is the North American subsidiary of LG Electronics, Inc., a $49 billion global force and technology leader in consumer electronics, home appliances and mobile communications. In the United States, LG Electronics sells a range of stylish and innovative mobile phones, home entertainment products, home appliances, and air conditioning systems and energy solutions, all under LG’s “Life’s Good” marketing theme. LG Electronics is a 2012 ENERGY STAR Partner of the Year. For more information, please visit www.lg.com.